Descended from a family of an old businessmans from Hamburg. At first he wanted to become a dentist. He studied singing in Hamburg and perfected his vocal uner Enrico Rosario in Milan. He began his stage career in the 1912-1913 season, appearing at the Stadttheater in Bochum. Then he was engaged in 1913-1915 seasons by the Stadttheater in Wilhelmshaven. After the First World War he took up his career and in 1919 sang at the Stadttheater of Nuremberg. He joined in the 1921-1925 seasons to the Stadttheater (Opernhaus) in Hamburg. 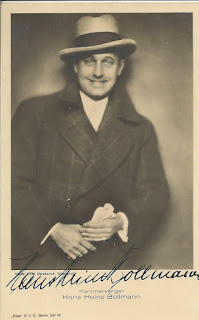 In the 1925-1926 season he belonged to the Berlin State Opera, then turned to the operetta repertoire and sang in different operetta stages of the German capital, thus in the 1927-1928 season at the Theater des Westen in Berlin, in the 1930-1931 season at the Theater in Admiralspalast, in the 1935-1936 season at the Berlin Metropoltheater (here in 1935 in the premiere of ‘’Ball der Nationen’’ by Fred Raymond) and in the 1937-1938 season at the Theater des Volkes. In 1927 he had a sensational success in Berlin in the operetta ‘’Eine Frau von Format’’ opposite Fritzi Massary as a partner. 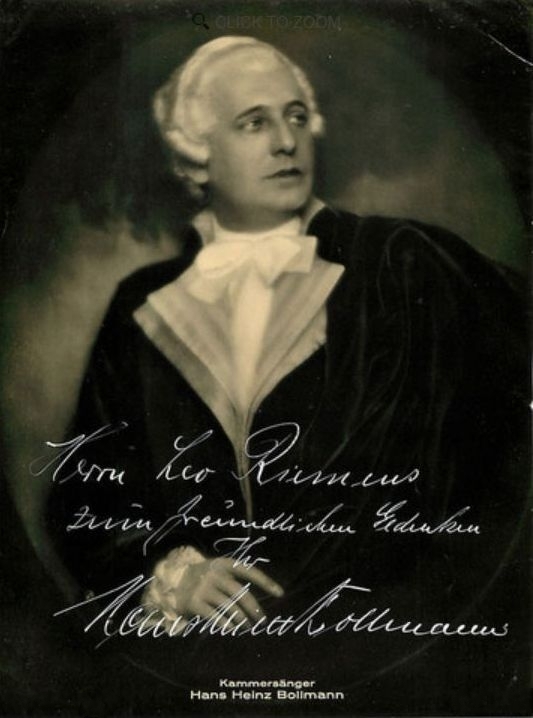 In the 1928-1932 seasons he guested at the Theater in Wien and at the Johann Strauss Theater in Wien. In 1938 he was to be heard at the Raimund Theater in Wien. At the Theater in Wien he sang in 1931 in the premiere of F. Lehár’s operetta ‘’Schön ist die Welt’’. 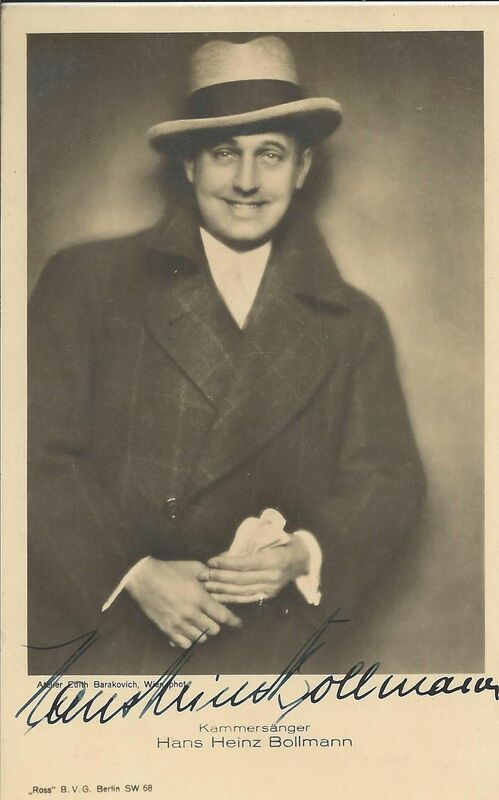 In Berlin he sang in 1928 with Vera Schwarz in ‘’La Barberina’’ of Ascher. He counted as a favorite singer of Franz Lehár. He sang with great success the following parts in F. Lehár’s operettas: Danilo in ‘’Lustigen Witwe’’, Titelhelden in ‘’Paganini’’, Goethe in ‘’Friederike’’ and Armand im ‘’Grafen von Luxemburg’’. His operatic repertoire included Don José in ‘’Carmen’’, Max in ‘’Freischütz’’, Rodolfo in ‘’La Bohème’’, Pinkerton in ‘’Madama Butterfly’’, count Almaviva in ‘’Il Barbiere di Siviglia’’. He also guested in Paris, London and the USA. Since 1930 he performed as film singer (‘’Frasquita’’, ‘’A song for you’’, ‘’Der Bettelstudent’’ in 1931 with Jarmila Novotná). His first wife was an operetta singer Friedel Bollmann. His daughter Hannelore Bollmann was a known actress.